IAABC Animal Behavior Conference this weekend! I'm looking forward to this weekend's IAABC conference, featuring presentations on cat, dog, horse and parrot behavior from Susan Friedman, Christopher Pachel, Lore Haug, Kristyn Shreve, Trish McMillan Loehr, Michael Shikashio, and more. Oh, and ME! I'll be presenting some of my favorite cat behavior case studies, looking at how different factors influenced recommendations and behavioral outcomes for cats and their families! It's not too late to register!!! If you can't be there, don't feel left out, I hope to do a better job live-tweeting than I did at Cat Con! 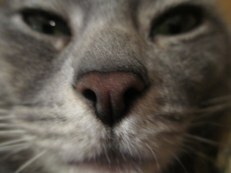 This week, Ingrid King was kind enough to interview me for her blog/website the Conscious Cat! I tell all about my personal path to a career in cat behavior consulting and the rewards and challenges it brings!! I also helped out my friend Kris Chandroo (who I featured on my blog last year) by answering some behavior questions for his "Ask the Vet" column at the Conscious Cat earlier this week. Look for MORE answers from me to MORE behavior questions at Ingrid's site in the near future!! Posted in cats. Tags: animal behavior, behavior consulting, cat behavior, Conscious Cat, IAABC, Ingrid King, Kris Chandroo on April 6, 2017 by Mikel Delgado. We know that cats have an excellent sense of smell, and good vision for certain things (like prey moving along the horizon). They need this excellent smelling, seeing (and of course sensing with other organs and body parts, like detecting air movement with whiskers, and sensing pheromones with their Jacobsen’s organ) to hunt, find mates, and avoid danger. But do cats have a preferred sense they rely on? And are all cats the same in this preference? Posted in cats. 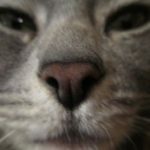 Tags: animal behavior, cat cognition, Cognition and Welfare Group, discrimination test, olfaction, visual cues on January 26, 2015 by Mikel Delgado. Who was Edward Chase Tolman? Edward Tolman is the man they named the Psych building for at UC Berkeley - but do you know about his contributions to the field of animal cognition? Or how he stood up for free speech in the age of McCarthyism? I wrote about him at the Berkeley Science Review! Posted in other important things. Tags: animal behavior, animal cognition, cognitive maps, Edward Tolman, free speech movement, loyalty oath, Psychology, UC Berkeley on November 24, 2014 by Mikel Delgado. I've had plenty of urban encounters with raccoons and they kind of scare the crap out of me. Like many urban "pest" species, they are amazingly understudied given their obvious problem solving behaviors and survival skills. Jason Goldman tells us more about the behavior and lifestyle of this fascinating animal. Posted in Friday faves. Tags: animal behavior, bird poop, camoflage, macaroni penguins, petrels, predation, raccoons, spiders, urban wildlife, vulnerable species on June 13, 2014 by Mikel Delgado. Do captive mice run in their wheel because they are neurotic and stressed? Or is it a natural mouse behavior? Well, it turns out that if you put a running wheel out in the wild, the mice will come. And they will run. Turns out frogs and other animals will join in too. Pretty cool. Read more about the study here, or download the open access paper here. Note: this does not "prove" that mice in captivity aren't running in a wheel due to stress! Best video from this story: a slug in a running wheel. Please watch. Posted in Friday faves. Tags: animal behavior, animal welfare, chimpanzees, mice, robotics, running wheel, sloths, slugs on May 23, 2014 by Mikel Delgado. Warming trends are changing these male Puerto Rican coqui frogs - like its effects on other animals, they are getting smaller, and their calls are getting squeakier. The summary article did not comment on how this might impact their ability to attract mates, but the manuscript suggests that changes in male frogs' calls without corresponding changes in the females' frequency-dependent detection system could have dire effects. Posted in Friday faves. Tags: animal behavior, animal cognition, climate change, conservation, coqui frogs, dogs, Eucalyptus trees, human-pet relationship, koalas, sexual signalling on April 11, 2014 by Mikel Delgado. My research examining how fox squirrels assess food and how these behaviors are influenced by factors such as season, food type and competition was recently published in PLOS|ONE, and thanks to open access, you can read it here; or you can read the abridged version at PLOS|ONE's blog, EveryONE. Posted in squirrels. Tags: animal behavior, baby squirrels, guns, oak trees, PlosOne, power outages, seed dispersal, squirrels, urban wildlife on April 8, 2014 by Mikel Delgado. This fascinating study had 4 and 5 year old children read one of two versions of a story about animals - one with anthropomorphism, and one that used factual language. Results suggested that children who read the story where animals were depicted with human-like traits were more likely to assign human psychological, but not physical, traits to animals later. 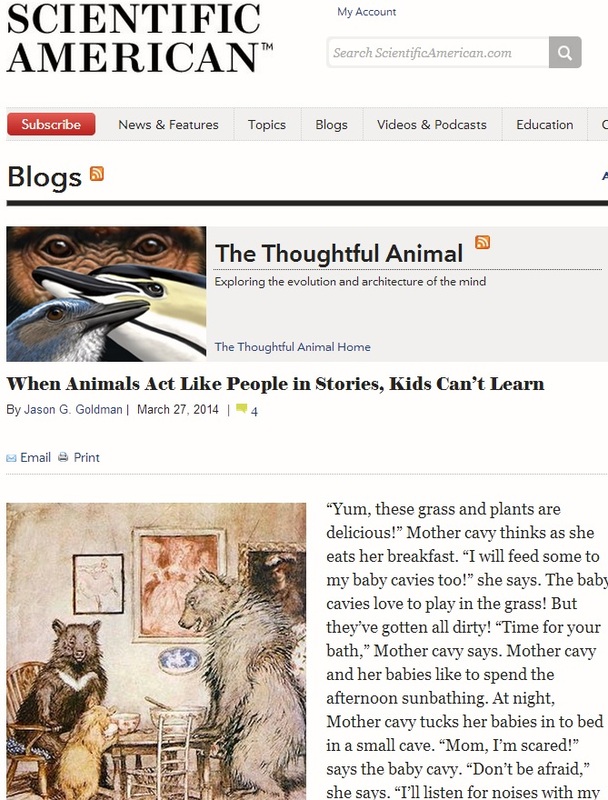 The Thoughtful Animal at Scientific American tells us more about it here. Posted in Friday faves. Tags: animal behavior, animal intelligence, anthropomorphism, big cats, cats, dogs, DogSpies, DOGTV, environmental enrichment, goats, New Caledonian crows, olfaction, social learning, water displacement task on March 28, 2014 by Mikel Delgado. 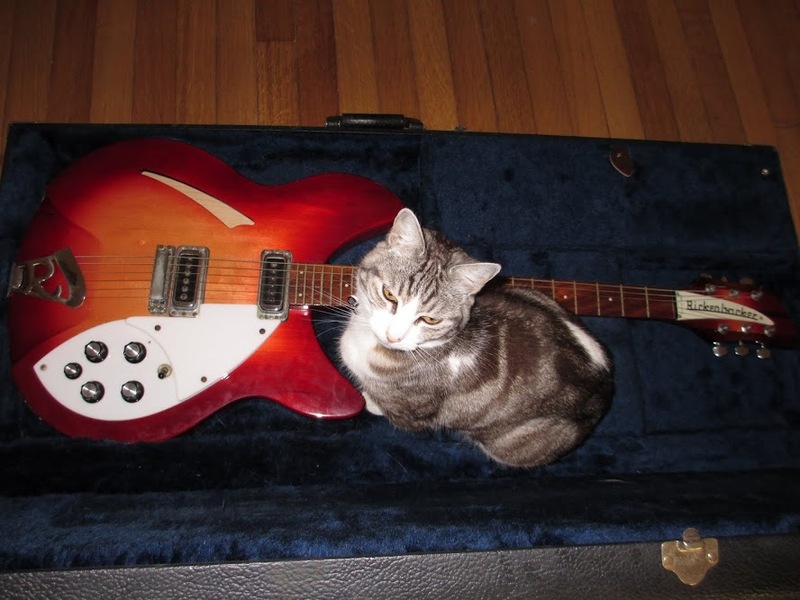 Do Cats (and other animals) Make Music? Is musicality something unique to humans? It’s a question scientists have been asking for years, but I thought I’d dig a little deeper after seeing a recent video of a cat playing with a theramin (an eerie-sounding, electronic instrument). I think the first thing to recognize is that musicality in humans is a broad spectrum – some of us love to listen to music, some of us love to create music, some of us love to dance and sing, and (strangely to me) some people could care less about any of it. Some people have perfect pitch,and others are tone deaf. Any time we try to determine if animals can do something we human animals can do, it’s important to think about how we define that ability. Posted in cats, other important things. Tags: animal behavior, animal cognition, elephants, music, musicality on February 25, 2014 by Mikel Delgado.